c. "four fragments of a red-figure calyx krater" / "quattro [frammenti] di un cratere a figure rosse" / "a calyx krater attributed to the Attic vase painter Euphronios". I have noted before: "The calyx-krater fragments, attributed to Euphronios by Padgett, appear to be the ones that were acquired in 1997: J. Michael Padgett, "Ajax and Achilles on a Calyx-Krater by Euphronios", Record of the Art Museum, Princeton University 60 (2001) 2-17 [JSTOR]." Acquisition: 1997-488 a-d. "Four fragments from a red-figure calyx-krater, attributed to Euphronios [Padgett]". "Museum purchase, Fowler McCormick, Class of 1921, Fund". Padgett had noted: "The findspot of the fragments is unknown". f. "a group of fragmentary architectural revetments" / "un gruppo di 157 elementi architetettonici con figure di tori" / "a group of Etruscan architectural terra-cottas". These would appear to be: Group of Etruscan "fragmentary revetments with painted and relief decoration ... Gift of Edoardo C. Almagià, Class of 1973 (1996-343.1-57)" and group of Etruscan "fragmentary revetments with painted bulls ... Gift of Edoarod C. Almagià, Class of 1973 (1996-48.1-100)". This makes 157 fragments. 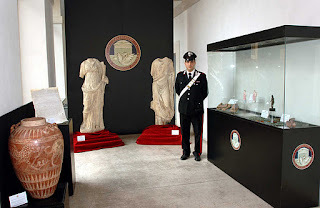 It appears that the reliefs and the pithos were derived from Almagià. Who sold the krater fragments and the two terracotta statuettes? Who gave the askos? It is clear from the New York Times that other material appears to have come from the same source. Princeton now needs to make clear its position on antiquities acquired through Almagià. Readers would do well to read the Princeton interview with Almagià in the light of the recent returns. There was also an interview with curator Michael Padgett who joined the museum in 1992.